See notes below by D.Butcher. This all started when Chris Larson gave me a plant he felt I should look at and try to give an opinion on. 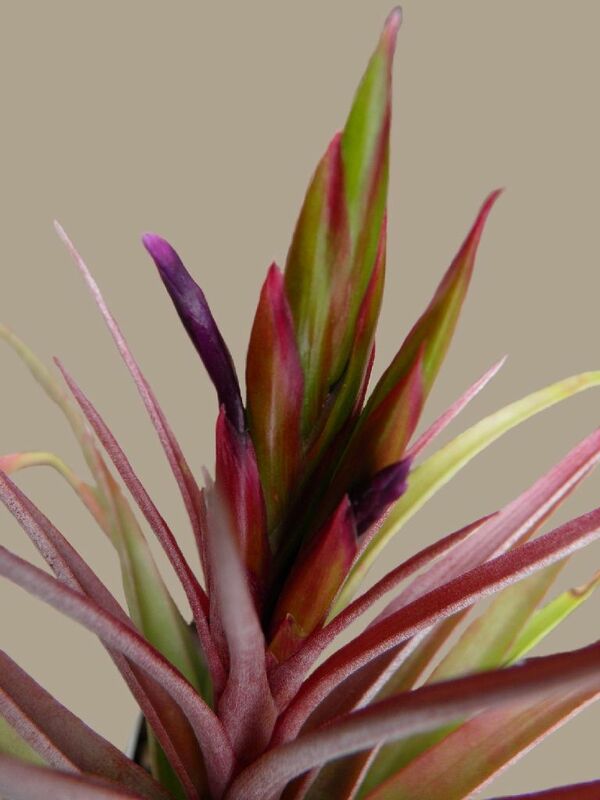 It had Tillandsia brachycaulos var multiflora (brachy x caput) GS on the label. At the time I thought that GS stood for Greg Stewart and that goes back 30 years. But apparently it is Gordon Slack! Now for a bit of taxonomical history. Let us look what I have on the Tillandsia DVD. 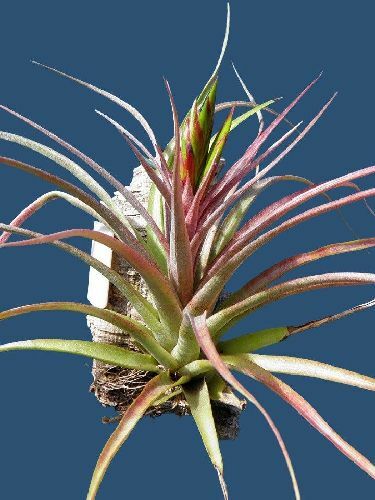 Tillandsia brachycaulos var. Multiflora L B Smith, Cont. Gray Herb. 154: 35, Pl 4, fig.3. 1945 SAID BY UTLEY (DEREBUS I 1994) and notation on holotype in 1978 TO BE caput-medusae x brachycaulos a natural hybrid – as yet to be proven. No plants following this description have been found in the vicinity since the original collection. However, if it is a hybrid then you cannot have a hybrid of a species as a variety! Type Steyermark 29465 (Holotype F), Rio Hondo, Zacapa, Guatemala, 10 Oct. 1939. All we had to go on was a drawing of one spike. No photos – nothing. 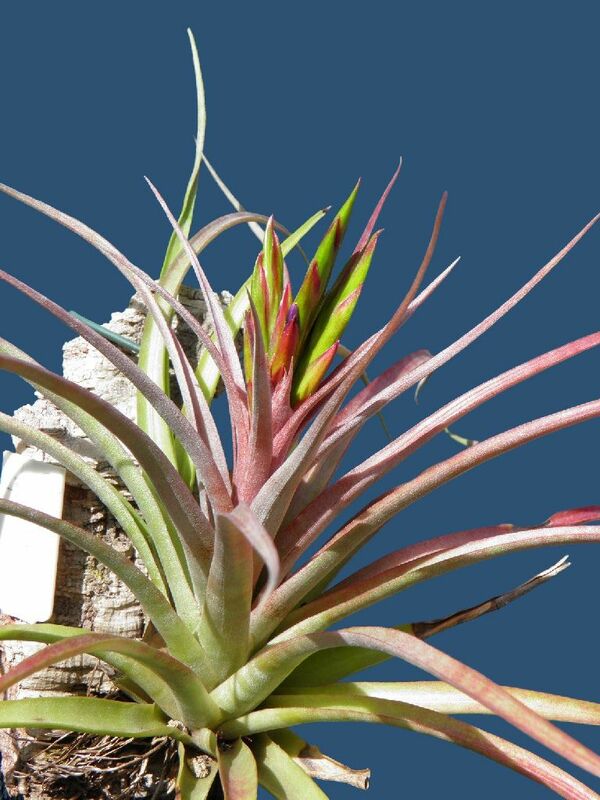 But in the 1990’s there were lots of different plants called T. brachycaulos var multiflora in cultivation. What was correct? Clearly ones without a branched spike were wrongly named. So I enlisted the help of Renate Ehlers and we still could not unravel the puzzle. Then in 1994 it was revealed to be a natural hybrid but we were no further forward because we did not know what it looked like. In those days I used to grumble to Harry Luther about not being able to see herbarium specimens and he would send me photocopies which were starkly black and white and awful to decipher. Then digital cameras came along and so many herbarium specimens these days are digital copies which are fantastic to look at, and YES, we now can see what holotype at F looks like. This is quoted above, under Type Steyermark 29465 (Holotype F), and means that a herbarium specimen of a collection by Steyermark is held in the Field University herbarium. So we have a base to work from. Many of the so called T. brachycaulos var multiflora in cultivation could well be caput-medusae x brachycaulos either from the wild or man-made. But what ‘brachycaulos’ was used or any of the species that were T. brachycaulos in Lyman Smith’s days like T. cryptantha, T. bradeaa, T. abdita, and then the newly descried species like T. velutina etc, plus the T. capitata that look like T. brachycaulos. I leave those to others to puzzle over. Here we are talking about one clone that Gordon Slack is involved with. 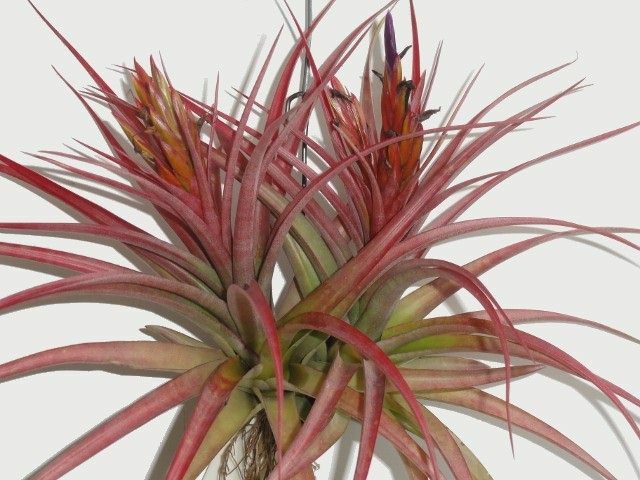 It was given to Gordon by the late Joe Rigby, another foundation member of the Hunter District Bromeliad Society, who was a very keen Tillandsia & species orchid collector. Joe sourced most of his plants during annual trips to northern NSW & southern Qld in the 1980 -90’s. At that time almost everyone was importing plants & it wasn't until the mid 90s or later that he came back with Tillandsia hybrid seedlings (? Reilly ) so I would not think his mature pupping plant would have been an Australian hybrid. After Gordon had read the Japanese book (Shimizu p 101) he added (brachycaulos X caput-medusae) to the label as it looked roughly the same. This is a feasible approach but unless you refer to original documentation you can be led further from the truth. To me it is distinct and differs from the only description by having short spikes, not elongated with floral bracts that strongly overlap not sub-lax. As for its origins, these will remain unknown whether collected in the wild or man made in the USA but the more I look at it the more I see some influence from T. concolor. Plant 35 cm diam, 20cm high. Leaves 1.5 cm wide at base, sheath merging with the blade which is narrow triangular, tapering to a point, to 22 cm long. Inner leaves turning red at flowering. Inflorescence with 3 digitate spikes each about 6 cm long, 1 cm wide, distichous, densely imbricate, to 4 flowered.